New York gold futures advanced on Wednesday to close 1.7 percent higher during the first quarter of 2010, marking the sixth straight quarterly increase for the yellow metal. Cited reasons for gold’s daily gain included dollar weakness and end-of-month physical buying. Silver and platinum also advanced on the day, and registered larger respective first quarterly gains of 4.0 percent and 12.8 percent. In other markets, crude oil ended March by rallying to a 17-month high and topping $83 a barrel. US stocks ended the day modestly lower, but enjoyed solid gains for the month and quarter. Gold for June delivery rose $8.80, or 0.8 percent, to $1,114.50 an ounce. It ranged from $1,103.10 to $1,119.90. Gold fell 0.4 percent in March. Silver for May delivery gained 19.6 cents, or 1.1 percent, to $17.526 an ounce. It ranged from $17.255 to $17.645. Silver rose 6.1 percent in March. July platinum advanced $20.80, or 1.3 percent, to $1,646.90 an ounce. It ranged from $1,621.10 to $1,655.30. Platinum gained 6.9 percent in March. In PM London bullion, the benchmark gold price was fixed earlier in the North American day to $1,115.50 an ounce, which was $8.50 more than the price on Tuesday. Silver ended 9 cents higher to $17.500 an ounce. Platinum was settled at $1,645.00 an ounce, rising $23.00. "The dollar is pretty weak," Dan Faretta, a senior market strategist at LaSalle Futures Group in Chicago, said on Bloomberg. "We’re looking for a rebound in the economy, but the jobs numbers aren’t getting any better. We’re going to see the dollar pull back and continue to fall. 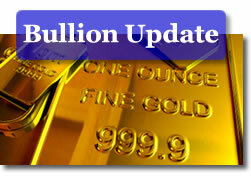 It’s going to be bullish for gold and commodities across the board." "The ADP report came in weaker than expected, pushing the dollar down and gold higher. Fundamentals are bullish for gold, there’s inflation concerns, Asian central bank buying, huge debt in the OECD," Societe Generale analyst Jesper Dannesboe, said on Reuters. "The reason we’re not trending higher is because the speculative part of the market has overbought long positions." In related silver news, the latest US Mint silver coin sales show demand increased across the board last week. Bullion American Silver Eagles, in particular, jumped to more than 3.3 million in sales for March, marking one of the best months ever for the coins since the series began in 1986. Finalized March figures should be available by week’s end. Oil prices jumped on Wednesday "as a weaker dollar helped offset a gain in crude-oil inventories that exceeded the American Petroleum Institute’s projections the prior evening," reported Polya Lesova and Claudia Assis of MarketWatch. The Energy Information Administration (EIA) reported that crude supplies rose 2.93 million barrels to 354.2 million barrels last week. Gasoline inventories increased 313,000 barrels to 224.9 million barrels. "The market is focused on the U.S. dollar today," Sean Brodrick, a natural resource analyst with Weiss Research in Jupiter, Florida, said on Bloomberg. "If we were trading on the fundamentals, the crude oil and gasoline numbers would be sending prices lower." New York crude oil for May delivery gained $1.39, or 1.7 percent, to $83.76 a barrel — the highest price since Oct. 9, 2008. Oil has surged 5.1 percent in March and 5.5 percent this quarter — a fifth consecutive quarterly increase. Prices are 69 percent higher from a year ago. The national average for regular unleaded gasoline rose three-tenths of a cent to $2.798 a gallon, according to AAA fuel data. The current average is 1.8 cents lower than last week, 9.3 cents more than a month back, and 75.0 cents higher than the average from a year ago. U.S. stocks finished lower on Wednesday "but higher for the quarter after a strong showing in March, as downbeat jobs and manufacturing reports cooled a recent runup," wrote Alexandra Twin of MarketWatch. "The ADP report caused jitters," E. William Stone, who oversees $102 billion as chief investment strategist at PNC Wealth Management in Philadelphia, said on Bloomberg. "Our view is that the recovery is sustainable, but I don’t think you can officially call it right now. When you get a question out there about the future recovery, you’re going to see market jitters." For Wednesday, the Dow Jones industrial average fell 50.79 points, or 0.47 percent, to 10,856.63. The S&P 500 Index lost 3.84 points, or 0.33 percent, to 1,169.43. The Nasdaq Composite Index declined 12.73 points, or 0.53 percent, to 2,397.96. For March, the Dow climbed 5.1 percent, the S&P 500 advanced 5.9 percent and the Nasdaq surged 7.1 percent. For the quarter, the Dow ended up 4.1 percent, the S&P 500 finished 4.9 percent higher and the Nasdaq ended up 5.7 percent. Although range-bound conditions still prevailed during the overnight market hours, gold prices were able to repair yesterday’s closing losses and return to near the $1110 value zone following a fresh decline in the US dollar. Indian buyers remained cautious last night, exhibiting signs that $1100 or lower would still be their preference when setting out to buy dowry-related baubles. That might be a bit difficult in view of the fact that April and May’s wedding season could keep price tags on the elevated side. A lot still depends on ETF-related demand overseas, and how the market shapes up in the wake of action in the currency markets (read: the dollar-euro tango). Meanwhile, all is apparently still not well on the gold fabrication demand front. Today’s Zaman reports that: "According to recent figures announced by TURKSTAT, the Turkish statistical authority, Turkey’s year-on-year exports went down by 1.3 percent to $8.43 billion in February 2010. [The] major cause for the fall was the decline in raw and semi-processed gold exports to $161 million in February 2010 from $1.6 billion in February 2009," Turkish State Minister for foreign trade Zafer Caglayan said." That is as sizeable a drop as we recall seeing in recent memory. The euro managed to reclaim the 1.35 level against the greenback, but apprehensions about Greece’s lack of success in raising funds via bond issue sales became manifest among currency traders and progress to the upside was slow, at best. Greece has unveiled plans to offer a global bond in dollars over the next two months as it attempts to raise nearly $16 billion in funding requirements by the end of May. Investors lost money on the country’s most recent sale of bonds, and the country needs to borrow somewhat north of 30 billion euros in the current year. Also undermining general sentiment in Europe were figures showing that regional inflation accelerated more than forecast (1.5% versus February’s 0.9% rise), courtesy largely of spiking oil prices, and that unemployment reached the round 10% level last month. Rounding out the category "dismal news harvest" this morning, the fact that analysts’ wildest (read: gloomiest) expectations about the state of Irish banking were outdone by the findings that the country’s banks need some $40-plus billion in new capital to address what some are calling "appalling" lending decisions made in the past. Why, there used to be a time in the US, when a house flipper who could fog up a mirror could get a jumbo loan based on stated income and a drive-by appraisal too…Think 2006. Gold prices opened firm for the start of a thinning-out midweek session, notching a $7.90 per ounce gain to the $1111.20 bid level. In the background, the US dollar was still slipping on the index and losing 0.31 at 81.17 while still recording three-month highs against the Japanese yen. Silver gained 21 cents to start at $17.49 the ounce. The noble metals complex appeared to benefit from further ETF-based attention as the quarter ends and piled on additional gains. Platinum added $22 to start at $1639.00 while palladium climbed $9 to open at $478.00 per troy ounce. Rhodium held steady at the $2460.00 mark this morning. The ADP employment data indicated that US firms eliminated 23,000 positions this month as against analysts’ expectation of 40,000 jobs being created. If this is a precursor to Friday’s Labor Department data, well, the dollar certainly did not like it. Gold, however, did — it added a couple of additional dollars to its opening gains on the news. Resistance in the yellow metal still lies overhead, first near the 100-day moving-average near $1120 and then higher up near the $1135.00 area. Thwarted rallies to those levels could once again engender pullbacks towards the $1080’s. Otherwise, thin conditions prevailed and price moves appeared to exhibit the general exaggeration in magnitude that normally accompanies a lack of participants reporting to work. Speaking of work, here is the latest in quarterly tallies, courtesy of the Kitco charts and data pages. So, how did QI shape up for the precious metals? That depends on which one you like to follow. Let’s start with gold. A theoretical purchase of an ounce of Kitco Pool in the yellow metal on Jan. 4 –the first trading day of the year- would fetch a net bid this morning at $1114.00 — for a net loss of nine-tenths of a percent. The average price of gold for QI looks set to come in at $1109.00 per ounce, still some $8 higher than the QIV 2009 average per ounce. This would mark gold’s sixth consecutive quarter of advances. Technical analysts at Germany’s Commerzbank opine that gold could advance to the $1135-$1145 level on a short-term basis. The strategists’ team remains "medium-term neutral as long as prices stay below the 50 percent Fibonacci retracement level at $1135 but above the $1073.85 January low point." Silver presents an essentially flat picture as well for the first quarter of 2010. Had you bought your ounce of Kitco Silver Pool on Jan. 4th, the net gain in your ‘book’ to date would be 1.1% per ounce at the $17.46 liquidation value this morning. The white metal’s average price for the quarter is set to come in at $16.92 the ounce. The trading range took the metal from a high of $18.84 on Jan. 11th to a low of $15.14 on Feb. the 8th and back to today’s high of $17.56 per ounce. Now, consider platinum, palladium for a moment. Or two. Platinum started the year at $1500.00 per ounce. Your theoretical Jan. 4th investment into one ounce of Platinum Pool would today yield a per ounce proceeds of $1640.00 — i.e., a 9.1% return on the money. The metal averaged $1561.00 on the quarter and finds itself at more than $150 higher than its 2010 starting level. Palladium was quoted at $421 on Jan. 4th of this year. A purchase on that date of an ounce of Pool metal and its subsequent liquidation today would net its owner am 11% gain on the quarter. The cumulative average for palladium’s price on QI is $441 approximately. "The unrealized paper gains for platinum stand at 63.5% after having held it for the past 365 days. Had you bought palladium at $183 an ounce 364 days ago, you would have a 219% return on your investment. A number that is neck-in-neck with the other stand-out performer in the precious metals complex: rhodium (at 220%)." Making money, versus preserving capital. The conundrum is all about white versus yellow, and it’s really no mystery at all. Investing for profit versus taking out a life insurance policy on one’s other investments and sleeping better at night. In addition to the bullion 2010 American Silver Eagle that is already available, the United States Mint this year will also issue the Yosemite America the Beautiful Silver Bullion Coin. Check out the link for more information on the coin and the new U.S. Mint silver series.